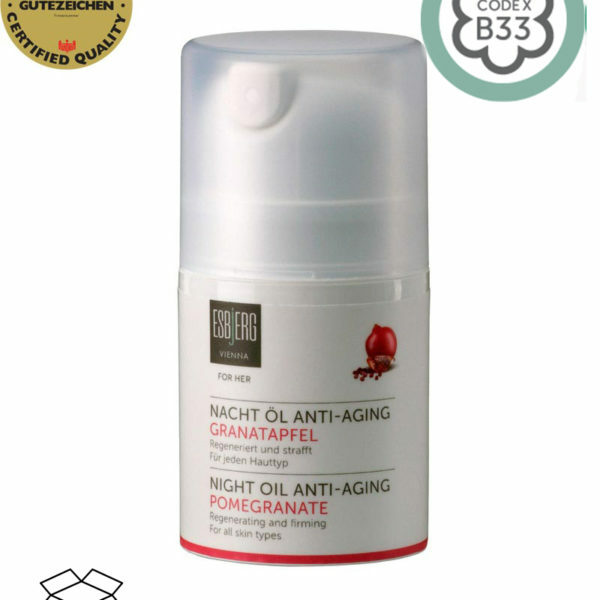 Organic pomgranate seed-extracts and vitamin E quickly provide the skin with important nutrients. The purely natural night oil essence promotes a firmer, more refreshed and rejuvenated skin overnight. Prepare your face at night to the cold of the day before. This night oil provides your skin at night with the necessary moisture to defy the cold. • and our nourishing and soothing Night Oil. 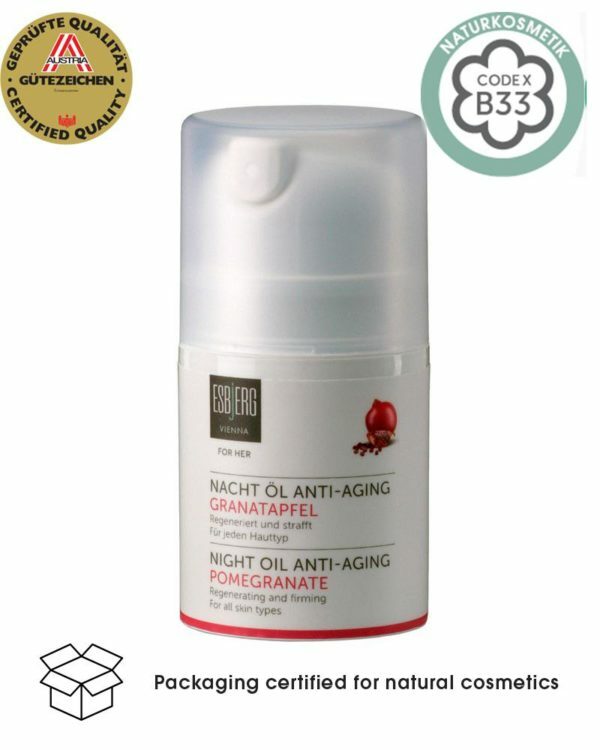 All three are rich in the most effective qualities of pomegranate seed´s extract. Suitable for every skin type (from sensitive to dry skin), the Anti Aging Night Oil regenerates and tightenes up the skin. The nurturing texture of organic pomegranate seed extract and vitamin E provides the skin with valuable energizing elements. First-class biological ingredients alleviate signs of fatigue and facilitate the regeneration of the skin. The 100% natural Night Oil essence is quickly absorbed and treats your body to youthfully fresh and tight skin in the morning. Pomegranate seed extract contains a high level of valuable ingredients such as punicic acid, linoleic acid, tocopherols, sterols and squalene. In cosmetics, this combination stimulates skin regeneration and the body´s self-healing powers. The valuable ingredients of the pomegranate have a soothing and healing effect on irritated, dry, allergy-prone and itchy skin. Bio-Sheabutter – is rich in vitamin A, E, Beta-Carotin and Allantoin. Extremely cheriched for its nourishing and cell regenerating properties. Shea Butter is the well-know for its great qualities of healing irritated skin. Wheat Germ Oil is herbal oil with the highest concentration of Vitamin E, which is popular for its antioxidant effect. This active component protects the skin cells from the damaging impacts of free radicals. Tangy/lively green Mandarine/Tangerine Oil is responsible for the Night Oil´s sweet fruity aroma. The scent has a refreshing and rejuvenating effect on the applier´s mind and body. At the same time, it relieves the skin and muscels tension. Apply to the cleansed face and neck in the evening, slightly massaging it into the skin, taking additional care for the delicate eye skin.